The world's largest atom smasher, the Large Hadron Collider, forms a 17-mile-long (27 kilometers) ring under the French-Swiss border. When you update your computer, you usually have to turn it off and back on again. The same thing is going on right now at the Large Hadron Collider (LHC) — humanity's largest particle collider — which will remain off between Dec. 3 and spring 2021 as it undergoes upgrades. 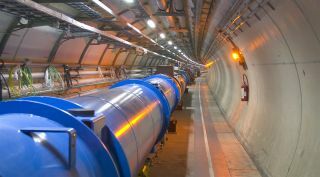 The LHC is a circular, 17-mile-long (27 kilometers) tunnel under the French-Swiss border, ringed by magnets. Those magnets accelerate streams of particles (usually protons, sometimes other things) to enormous speeds, then crash them into one another. Scientists study the splattered remains of those collisions, where unusual particles sometimes emerge, to search for as-yet-unseen building blocks of the universe. The most significant discovery so far was the Higgs boson, the last component of the standard model — the reigning theory that describes interactions between fundamental particles — to be spotted in the real world. But nothing comparable has turned up since. The LHC's operators hope this new upgrade to intensify particle beams might lead to more interesting results. This is the second such quiet upgrade period, so CERN, the European research organization that operates the LHC, has termed it the Long Shutdown 2, or LS2. The most significant changes, according to a statement, involve the machinery for stripping hydrogen down to individual protons and injecting them into the tunnels. Whole components will be swapped out for more powerful versions of themselves, enabling the proton beam's energy to jump from 13 to 14 tera electron volts (TeV). That's actually not a whole lot of energy in raw terms — about 14 times the motion energy of a mosquito. But it's compressed into a space trillions of times smaller than a mosquito. CERN will also upgrade the detectors (the equipment that monitors the results of the smashups) throughout the LHC, according to the statement, and it will improve on some of the equipment used to protect the particle collider's sensitive components.